Sky-mobi Ltd., $MOBI, has my most covered stock on twitter over the past month with 14 total posts, including today’s tweet. I first highlighted the stock on March 24, 2011 at $11.52 as it blasted up 21% on volume 495% larger than the average. What did I recommend? ACCUMULATE! I also complained that stocks like $MOBI don’t make the IBD 50 list quick enough. Well, the stock is now up 80% since I started to track it using IBD’s research tools and more than 100% since the actual run to new highs started. The overall run from the initial breakout after the IPO now has the stock up 300%. Young stocks making new highs on HUGE volume (with low float) will typically always make AMAZING runs in a short period of time. Jump on them and enjoy the ride. Stop out if they reverse – keep it simple. I talk about placing a stop to lock in minimum gains back on 4/15 – I still recommend a trailing stop, no less than the $15-$16 range to allow for normal pullbacks. I also talked about locking in gains overall after the 60% gain and I don’t have a problem with that advice, even at 80% plus gains now. The stock has powerful supporters taking it to new highs every week. I don’t have a problem with traders taking positions on low volume pullbacks. 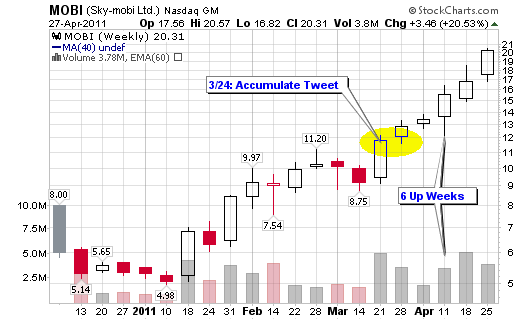 4/27: $MOBI – 20.21, now up nearly 80% in 1 month. 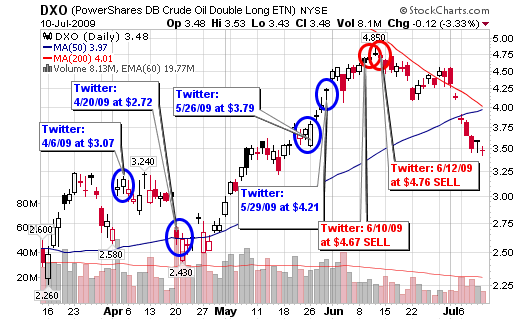 My most heavily covered stock on twitter since 3/23 – what a beauty! 4/19: @StockTwits @DynamicHedge You missed $MOBI up 60% in less than 4 weeks. 4/19: $MOBI – 17.94, lock in gains now. Up nearly 60% from $11.52 in March. 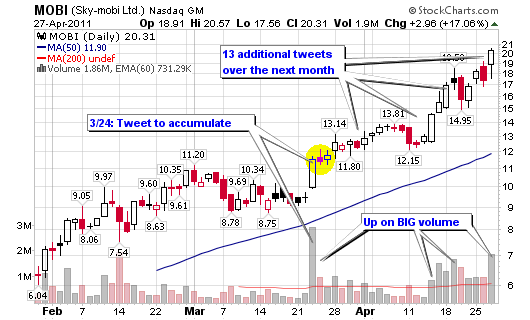 4/15: $MOBI is en fuego, up 35% at $15.60 from $11.52 twitter coverage. Place stop to lock in min 20-25% gain. The month was March and the year was 2009, that’s when I joined Twitter and started to post up stocks making strong price and volume moves to the up-side during the newly established up-trend. The up-trend or bull market as some like to call it began in March 2009 (I joined 3/31/09 but have been blogging since January 2005). From March to August, I posted up 56 stock positions that I liked on the buy side (Note: several stocks made multiple tweets at multiple prices and different dates so their tickers do repeat). Of those 56 stock positions, 44 of them are still showing a profit, nearly two years after the start of the new bull market. This observation is based purely on a buy and hold scenario (clearly not the way I trade or recommend anyone to trade). However, for purposes of this blog post, we will use the “simplest” form of explanation to drive home the powerful point of buying and selling with the major market trend. The best performer was CXO, listed multiple times from April to August with a top gain of 282% (as of the close on Friday, March 25, 2011). 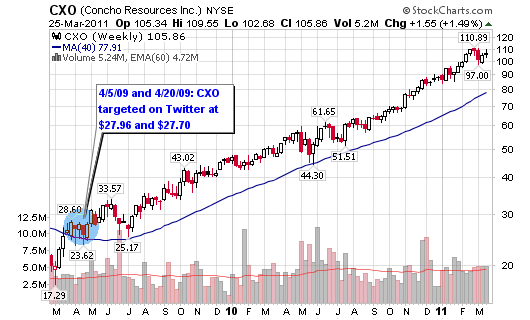 CXO was targeted as it traded in the $27 range and then again in the low to mid $30’s; it closed Friday at $105.86. In total, 14 stocks are currently showing a gain of 100% or more with six of the positions larger than 200%. Note: ARST was bought by HPQ for the share prices used in this blog ($43.50 from $16.96) . On the flip side, 12 stocks are currently showing a loss with FRPT leading the way, down over 30% from $7.09 to $4.96. Please note that several of the “losing stocks” listed went on to make gains of 5%, 10% or 20% but then collapsed. For example, CISG went from $18.25 to a high of $28.33 before closing Friday at $13.54, showing a 26% loss. But, the “buy and hold” hypothetical scenario will cancel out the true losses from the true gains (not all winners would have been held the full two years for maximum gain). Please note that “true” buy and sell rules would have closed out many of these actual positions as they took 5%-8%+ losses and the winners may have been closed on pullbacks of 15% or more. A pure buy and hold scenario would give you a 57% gain (as of today), buying $1,000 worth of shares in each of the 56 positions. The point of the post is to show how STRONG and LONG LASTING a MAJOR TREND REVERSAL is in the market. The major trends can last for years before fizzling out, trading sideways and then starting a new trend or reversing in the opposite direction. I didn’t starting showing the possible trades in early March which was the ultimate bottom and I can’t tell you when the “ultimate top” will be but pay attention, this up-trend is in a late stage (vulnerable). 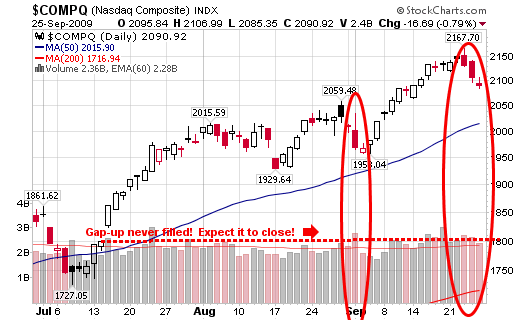 A major market reversal has NOT been confirmed but keep a close eye on your positions. If we move higher, hold tight and even add shares where warranted but start to sell when the NH-NL Ratio confirms any clear distribution and downward movement by the major indicies such as the $INDU or $COMPQ (price and volume). I am not a buy and hold investor but you can clearly see the huge gains that strong (and young) growth stocks can give to your portfolio – just by spotting a major trend formation. Ride the trend, it’s that simple! Enjoy and stay tuned as we watch quietly, carefully and patiently for any potential trend reversals. Visa (V) turned out to be the stock I tweeted about the most starting on March 31, 2009 (my first day of twitter) at $55.60. I mentioned that “the pivot point is $61.50…then look for $60-$100 move” on April 26 2009. Well, the stock closed the year just shy of $90 and is well on it’s way to a $60-$100 run for a near 60% gain. Disclosure: I personally owned more shares of Visa in 2009 than any other stock listed below (my position is currently 100% closed). The top gaining stock of the year was MELI, featured on May 12, 2009 at $25.60; it closed the year at $51.87 for a 103% gain. A full spreadsheet of my picks can be found below. I figured I would recap my last 100 tweets to those of you that still check into this blog but don’t follow me on twitter. Please, check me out on twitter as I do most of my writing and thoughts over there as the new family life prevents me from writing intense, heavily researched stock blog posts. I am not in the business of writing short crappy blog posts so I focus my time on actionable ideas and education on twitter. 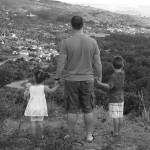 I plan to one day return to more consistent writing on the blog. 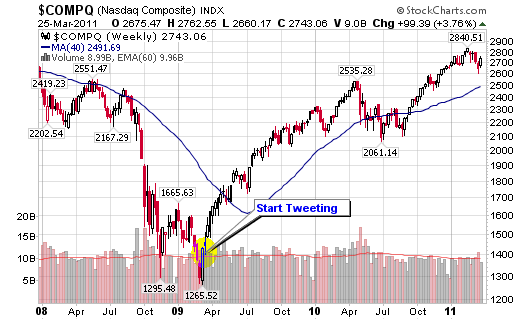 Until that day, follow my tweets to stay in touch with my thoughts on the market (1,200 other people already follow). If you can take anything away from my recent tweets, focus on the message of the following ten tweets, reference the bold type (they all show caution and skepticism in the market based on the lack of individual leaders). New Highs have been reaching levels not seen in years but they are still far below the levels necessary for a “true bull market”, one that will be sustainable. See below for the complete list of my most recent tweets (100 total tweets – all dated and reproduced exactly as they appear on twitter).